When the Vancouver 2010 Olympic Games ended, and the cauldron was extinguished, we felt a sadness. There was so much excellence in sport, so much heart, so much excitement and friendliness even just on the streets of Vancouver – and then it was gone. Little did we know that within just a few days we’d have all of that back, ten fold. The Paralympic Games that follow reignite that fire, with their amazing athletes and spirit that will leave you in awe. From March 9-18, 2018, I highly encourage you to tune into the PyeongChang 2018 Paralympic Winter Games and continue to cheer on Team Canada. Approximately 670 athletes from around the world will compete in a total of 80 medal events. 55 athletes have been named to Canadian Paralympic Team for PyeongChang 2018 Paralympic Winter Games. This includes the largest contingent is in Para ice hockey with 17 athletes, and 25 athletes will be making their Paralympic debut. 18 members of the team already have Paralympic medals on their resume and the team will be led by Chef de Mission Todd Nicholson, a three-time Paralympic medallist in Para ice hockey. Canada will be represented in all 5 sports on the Paralympic Winter Games docket: Para alpine, Para ice hockey, Para nordic (cross-country and biathlon), Para snowboard, and wheelchair curling. The most experienced Paralympian is hockey player Brad Bowden with 5 previous Games appearances to his name (four Winter, one Summer). Para nordic skier Brian McKeever holds the most Paralympic medals on the team with 13, including 10 gold, two silver and one bronze, from four Paralympic Games. The oldest athlete on the team is James Anseeuw from wheelchair curling at 58 years old. The youngest athlete on the team is Para ice hockey’s James Dunn who turned 17 years old on in November. 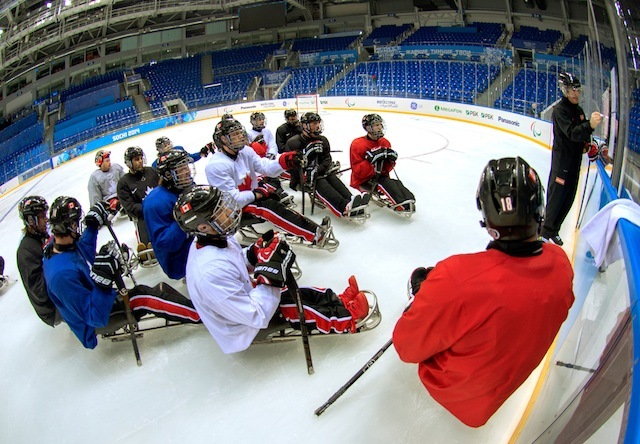 Team Canada Sledge Team practices before the 2014 Paralympics in Sochi, Russia. Photo: Matthew Murnaghan/Canadian Paralympic Committee. 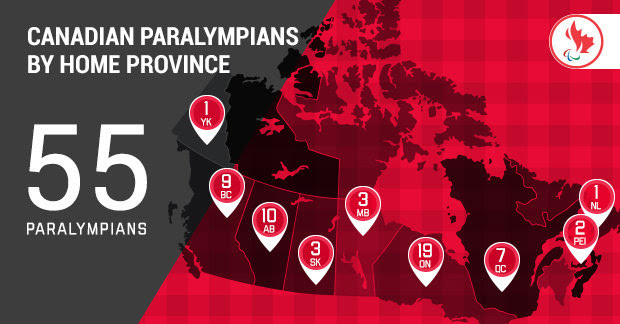 Ontario is home to the most members of the Canadian Paralympic Team with 19 athletes hailing from the province. Following behind is Alberta with 10, British Columbia with 9, Quebec with 7, Manitoba with three, Saskatchewan with 3, and Prince Edward Island with 2. Yukon and Newfoundland and Labrador each have 1 athlete. Three athletes have also competed in summer sports at the Paralympic Games: Brad Bowden, Cindy Ouellet, and Liam Hickey (all in wheelchair basketball). Ouellet and Hickey will be making their Winter Games debuts. The roster includes three guides: Jack Leitch (guide for Mac Marcoux) and Graham Nishikawa and Russell Kennedy (guides for Brian McKeever). 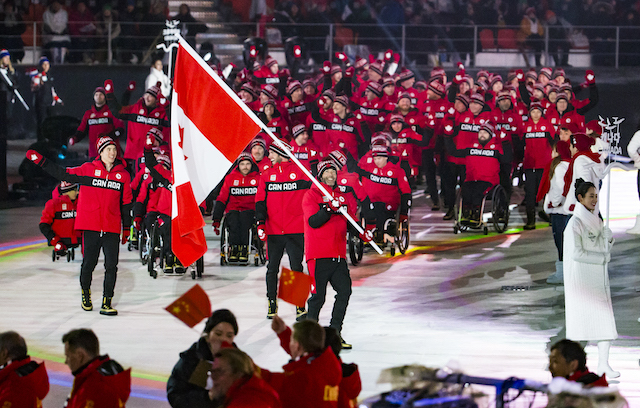 PyeongChang 9/3/2018 – Flag bearer Brian McKeever leads Team Canada into the Paralympic Stadium during the opening ceremony of the 2018 Winter Paralympic Games in Pyeongchang, Korea. Photo: Dave Holland/Canadian Paralympic Committee. Canadians will be able to connect more than ever to the nation’s Paralympic athletes, as every minute of the Games will be broadcast via the Canadian Paralympic Committee’s media consortium, which will include coverage on Canada’s Paralympic Network CBC and Radio-Canada, Sportsnet, AMI, Facebook, and Twitter. Follow the Canadian Paralympic Team on Twitter, Instagram, and Facebook for updates.